Should you adopt a pet Saint Bernard? 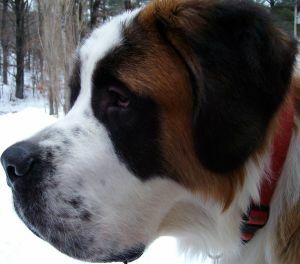 The Saint Bernard is well known as Beethoven from the the Disney movie. Maybe you are here because you recently saw the movie Beethoven and fell in love with this large dog Breed? If so, I urge you to take your time in considering this. A large dog breed requires very careful consideration. Especially one as large as a Saint Bernard. The St. Bernard grows to as much as 240 pounds (110 KG) and stands as tall as 35 inches (90 cm). They can have short or long hair and are known to drool a fair bit. So try to imagine 240 pounds of fur roaming your home! Due to their size alone they require good training so that they learn to respect humans and other pets. A playful move could injure someone. Another downside to their size is that they can be prone to deterioration of their bones and have joint problems. Careful attention to their diet and exercise is important. The St. Bernard dog breed is widely known as a rescue dog. They earned this reputation because of their work in the Swiss Alps. Their large and strong bodies, together with their thick fur, made them a great choice for rescuing people in need. Their gentle and caring personality also made them one of the best dog breeds for the job as a rescue dog. Their role as a rescue dog puts them in the Working Dog Breeds classification at most kennel clubs. Their gentle and caring personality also makes them a good family pet – for a family with time to train a massive dog and budget to feed it! Oh, and vet bills are higher for larger dogs too. And who will care for it if you go away? Sorry if I am lecturing, I just really want you to think carefully before adopting this wonderful, large dog breed, as your pet. For the right person, the St Bernard is a great choice. They are devoted, loyal and fun loving. They are generally good with children so if the size hasn’t deterred you don’t let having kids deter you. So should you adopt a Saint Bernard? Well, if you have a good budget, time to train one, and a home that is suitable, I suggest that you visit some breeders and chat with them. Or visit a St Bernard Rescue group. And don’t be shy about your local shelter. St Bernards that end up in Shelters are sometimes there just because their owners didn’t realize how much effort such a large dog breed would be!